Over 2,000 miles, across two state lines, through farmlands, ranchlands, across busy highways and vast plots of timber, Oregon 7 has survived. 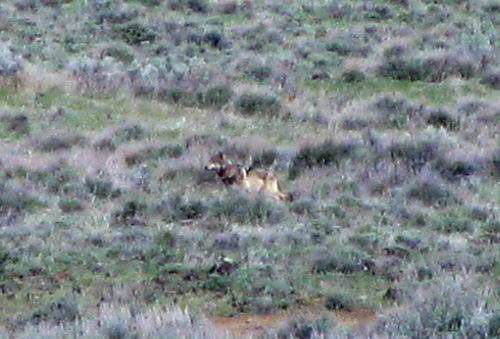 Yesterday, a photograph, only the second ever taken of him, was snapped in Modoc County, California by a State Biologist with the California Department of Fish and Game. In a flat field of sage and dry dirt, Journey looks a bit out of place, as if he’d taken a wrong turn and ended up in the desert. He appears tilted almost, leaning into the background like he’s trying to meld himself into it, become a part of his new environment. I had a thought while gazing at this photo. I realize wolves disperse widely, leave their family of origin and their home-grounds and travel widely, but what if Journey were actually lost and each day was an effort to return to Northwest Oregon, the Wallowa Mountains, the cold water of the rivers, and the Imnaha pack of his parent’s and siblings? At times, it is a challenge to have compassion for animals and want to understand them more. We are so limited in this, we study them, read about them, follow them around, but how little we know of the internal workings, the minds, the soul, if you will, of an animal like Oregon 7? Whatever his course is, and for whatever reason, let’s hope he is safe and soon arrives at his destination where he will be free to live a long and wild wolf life. I cannot say, I can only guess that he would have admired this little piece of ‘mystery’, roaming through the States as he pleases. Who’s the man? Beckie, it was nice to meet you and Hannah at Carter Niemeyer’s talk in Eugene the other night. Great meeting you too, Randy, and nice to see another Imnaha pack tee shirt! I’m looking forward to checking out the website you mentioned. Thanks.